Quatuor Diotima positioned Unbreathed betwixt two other works, Szymanowski’s 1927 Second Quartet and Schubert’s massive String Quartet No. 15 in G, composed late in his life. The Szymanowski was odd when it wasn’t being just plain meh, whereas the Schubert was a fascinating and at times excruciating tl;dr study in how far material could be pushed and worked while still holding onto its integrity (personally, i thought the integrity was emphatically broken, but in some ways that only added to the experience). While the Diotima’s performance of both these works was outstanding (and, in the case of the Schubert, herculean), it was more telling in the way it provided an interesting and useful perspective on the Saunders, particularly in terms of the nature and precision of pitch. The skull is enveloped in a profound silence that seems nothingness itself. The silence does not reside on the surface, but is held like smoke within. It is unfathomable, eternal, a disembodied vision cast upon a point in the void. So far, so relatively familiar, yet the way these concepts were explored sets Unbreathed apart from most if not all of Saunders’ work of the last few years. The first of its two sections initially felt as though it were all about just one main pitch, projected such that it was as if the quartet were twiddling with various filters that kept blurring, altering, refracting and obscuring it. If anything, though, this only served to make one’s perception of that pitch more pronounced, the obfuscation actively drawing attention to it, and this, together with the sense of repetition that accompanied this opening episode – the quartet repeatedly presenting new, increasingly remote renditions of the pitch – established an immediate clarity of both form and content that is unusual in Saunders’ work. Not for long, though; at some point it became clear that the pitch had by now been left behind (or processed beyond recognition), the quartet – relentlessly playing as one, as if their bows were linked together – now focusing their attention elsewhere, directed into more and more rapid, runaway material. This was where the music moved from remoteness to negation: on the one hand, this was more familiar Saunders territory, though the material was so violent and torrential that i continually found myself wondering whether it constituted substance or was actually the manifestation of some kind of ‘anti-substance’, Quatuor Diotima channelling a cross between dark matter and a phantasm. Whatever it was, it burnt itself out in a massive tutti climax. The shorter second part of Unbreathed (which could almost be regarded as an extended coda) returned to remoteness, the quartet, now individuated, articulating very quiet sounds in a disembodied way, even to the point that they seemed disassociated from their instruments. As hinted at by the end of Saunders’ inscription, the music gradually reunified, demonstrably seeking to become something more tangible, yet the result was even more remote, like an idea buried beneath encrusted layers of accretion and process, while at the same time constantly slip-sliding around, unable to maintain its balance. Somehow, the conclusion did attain a strange, unexpected form of equilibrium (stability would be too strong a word for it), as though the filters twiddled at the start finally brought things back into focus at the very moment the piece ended. 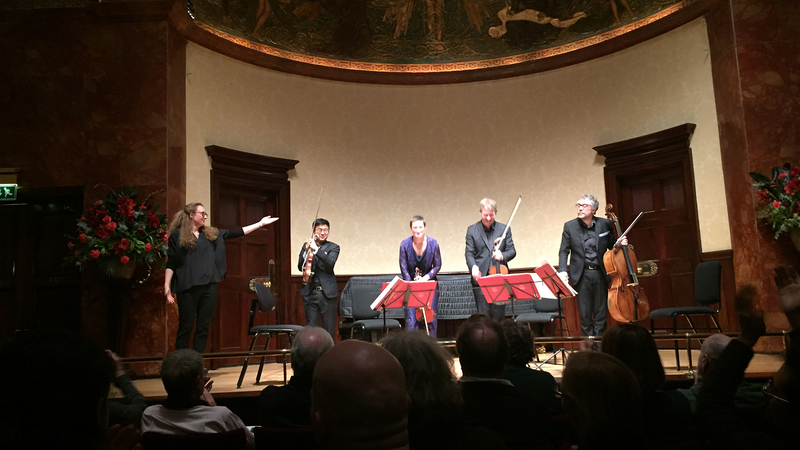 Despite suffering from an appalling number of contributions from the clusterbomb of bronchial hooligans lurking in the Wigmore Hall audience, Quatuor Diotima’s performance of Unbreathed was mesmerisingly effective. 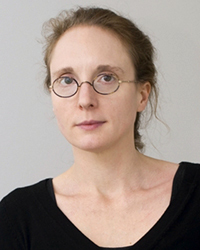 And while one expects to feel disconcerted and challenged when listening to Saunders’ music, Unbreathed was clearly something different: more contained perhaps, certainly more immediate and direct, though in its exploration of remoteness and negation once again requiring a lot more than just a single listen to fully grasp and relish its filigree intricacies. While i’ve no doubt the piece will be widely-heard, the UK’s track record of supreme indifference suggests it’ll be a long time before we hear it again here. Thanks for review Simon. I agree her work is criminally underperformed outside Huddersfield and London. Any word of a recording on Wigmore Live or a radio broadcast? I’m sure you are aware Skin is being performed in London in May? Hi Alan – happy new year :) Nope, i know that the Wigmore Hall performance wasn’t recorded (and i chickened out of using the portable recorder that i’d taken with me!) but hopefully one of the forthcoming ones will be. i saw that Skin is being performed in May – great news! It’s also included on the Donaueschingen 2016 2CD release that NEOS are bringing out next month (a copy arrived in the post today) – this is a recording of the world première. Great news Simon, will investigate.